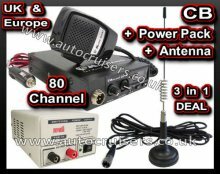 This is the latest model of CB Radio from Midlands. The new Midland 203 plus multi Citizens Band radio is a Multi Standard CB transceiver with a sensitive receiver that will hear a pin drop! The Phase Locked Loop circuitry used gives precise frequency control and stability, (pinpoint channel tuning accuracy with separate scan up and down controls); the ceramic filters in the receiver give excellent selectivity, to reduce and eliminate adjacent channel interference. Microphone which is supplied with this CB is a 4 pin standard microphone which has no channel change buttons. This CB will stay on set channel when power has been disconnected unlike the Midland 38 and 98 models. The Midland 203 Plus Multi comes complete with a microphone, mounting bracket and power supply cable (which is fitted with a cigar lighter style plug which can be removed if not required. § Dual function switch: AM/FM EN/EC. § Microphone Jack for 4 pin standard microphone. § CH 9 - 19 switch. § External speaker jack plug. § 12V power supply required. § The Midland 203 plus can be set on the following frequency bands:IT, EU, PL, D4, UK, EC, I2. § A frequency band and restriction of use chart is supplied. Lightweight and compact, is a 3-5amp fixed 13.8v switch mode power supply.